I have always liked the look of flocked dashes, when one came up at a good price. I couldn’t turn it down, and as part of a a trip to Wales with work I collected the flocked dash. 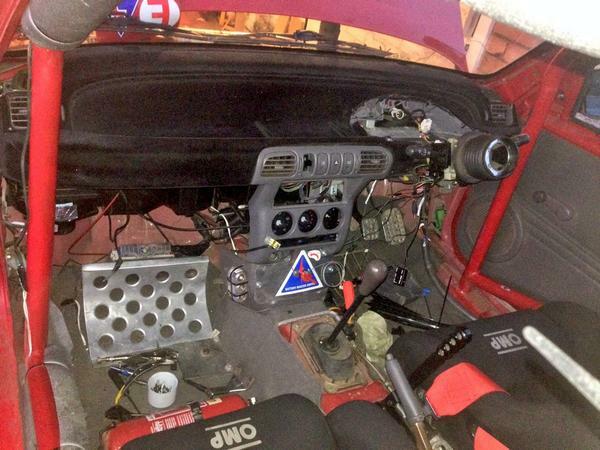 Removing the old dash proved to be a lot of hard work, with the roll cage being welded in, it was always going to be a bit of battle to get the old dash old. After a lot of work, and some scruffed knuckles and choice words. I managed to remove the dash. With the dash out, I was able to remove nearly all the sound proofing hidden behind the dash, which combined with bits of dash not returned to the car, has seen a weight saving of over 2.9kgs! Also with the dash out, I was able to route the pipework and wiring for the newly relocated screenwash bottle, which now lives behind the drivers seat. The new bottle is smaller, so it will hold less screenwash (weight) and is a lighter bottle too. Oh and cracked the windscreen – oh boll*cks….! This entry was posted in Uncategorized on September 7, 2014 by projectmicra.